Hi friends, I hope you all had a wonderful weekend. We had a nice weekend which included a visit to the Wildflower Center. I love that place and now they have early morning openings for members on Saturdays. We were there pretty much around 7:30 and few people were about so at times it felt like we were the only ones on the trail. Well, and the cardinals, squirrels and other birds and wildlife. We didn’t see a lot of blooms just yet but they are starting. I was surprised to already see quite a bit of bluebonnets. There really is something special about being out in nature isn’t there? After our visit to the Wildflower Center we came back home and after lunch I headed out to Half Price Books. Unfortunately that was kind of a dud. I don’t know what was going on but there were tons of people and it was hard to look around so even though I had a 50% off coupon, I walked out without a book. Shocking, I know. So that was that. The rest of the weekend I’ve been doing a bit of bookbinding. I’m recycling an old book and turning into a dream journal. I’ll have to share some pics of the progress so far. I did a bit of reading for my HR coursework and tried to catch up on magazines. I have a huge pile to donate to the library and will not be renewing a lot of those subscriptions. It’s mainly magazines we got due to airline miles and those magazines aren’t my faves anyway. On the book front, I’m really enjoying the romance novel I started last week, Hello Stranger by Lisa Kleypas, but I need to add a mystery to my books in rotation so I’ll see what I add tonight. Hope you have a great start of the week! Yes, the bluebonnets are starting to show up. I haven’t seen many in my part of the area – still a little early – but I saw them on Mopac. And we’ve had enough rain that all the wildflowers should be lovely. I bet Half-Price was indeed crowded. They’ve been handing out those coupons for quite a while. Hope the rest of your weekend was good. Good for you to get some exercise before it got too hot. Did you get caught up in the SXSW traffic? I loved reading about you visit to the wildflower center. Makes me want to go visit the Botanical Garden here. 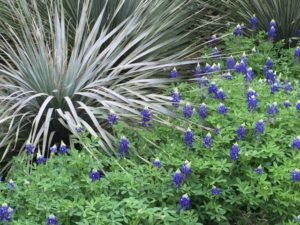 I love being outdoors and the Wildflower Center sounds pretty and peaceful. Enjoy your reading! I got all excited thinking the photo was of your garden! The Wildflower Center sounds like a wonderful place to visit.